When I went to Iowa on the 11th, I decided that trip and this one to Ohio would be good ways to go through the CD holder, listen to music and change what I have in the holder. I tend to listen to the same stuff over and over because I don't want to go through the hassle of finding the jewel cases for what's in the holder and changing the music. But when I've got all this music surrounding me, it should be something I should do. I bought this music because I liked it. Then I should be listening to it. The trip to Ohio allowed me to listen to 14 different CDs. Of course, my tastes being what they are, three genres were featured: jazz, Scottish and classical. On the ride out, I started with A Treasury of Artie Shaw. He was a big band leader during World War II, played clarinet. My favorite song on this CD is "Begin the Beguine". Next was The Tannahill Weavers Collection: Choice Cuts 1987-1996. This is a greatest hits collection. It's a good choice if you aren't familiar with them. Then was Old Blind Dogs and Tall Tails. While this CD has some catchy tunes; Wife in Ev'ry Port, Pills of White Mercury and Barnyards of Delgaty; it's not my favorite OBD collection. I skip over at least a couple of the songs. After that was the seminal Miles Davis recording, Sketches of Spain. If you are looking to include some Miles Davis, I strongly recommend this recording. From there, I went to Gene Harris/Scott Hamilton Quartet and At Last. Gene Harris was a pianist and Scott Hamilton is a saxophonist. It's a nice addition to my jazz collection even if it's not something I might reach for when wanting to play music. The black CD is The Best of the Rat Pack. This is a collection of music sung by Frank Sinatra, Dean Martin and Sammy Davis Junior. It's what could be termed a 'little ditty' of an album. There are better collections by each of these men, but this is a good way to have something from each. "Me and My Shadow" by Frank and Sammy, is one of my favorites. I play this and remind myself that I need to search out a Sammy Davis, Jr collection. He had a wonderful voice. 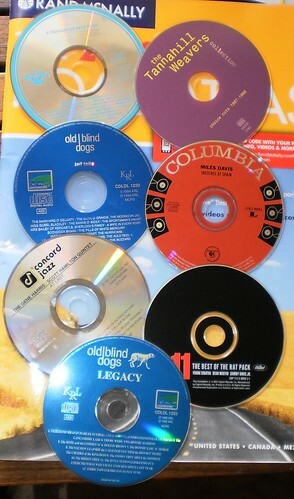 Lastly, on the player as I pulled into the driveway was Legacy by Old Blind Dogs. I like everything on this album but my favorite is "The Snows They Melt the Soonest". On the way out, I started with the radio but quickly lost the signal as I headed east. 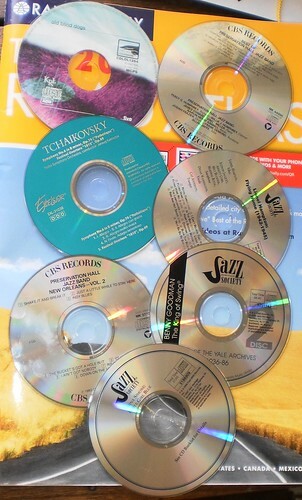 Since I don't know any jazz stations close to Youngstown, I simply stayed with CDs all the way home. If I do another road trip, I need to find a listing of radio stations that play jazz in the locations I find myself. Then, carefully copy down the call letters and number and leave that list on the kitchen table as I head out the door. I started the trip back with Five by Old Blind Dogs. The opening numbers, "Trip to Pakistan" and "Battle of Harlow" are two of my favorites. "Parcel Full o'Rogues" is a lament on the union of Scotland and England. This is the second CD I've owned of this, so that tells you how much I enjoy it. Next up was Best of the Preservation Hall Jazz Band. Preservation Hall is located in New Orleans, for those who don't know it. They play New Orleans-style Dixieland jazz. This collection has their anthem, "When the Saints Go Marching In". They tour a lot so if they come near you, go see them. After that, I played Tchaikovsky. This CD holds his "Pathetique" and "1812 Overture" on it. It's hugely ironic that this should come up as I'm just taking the CDs as they are in the holder. We had talked briefly about Tchaikovsky on Sunday night. I did not know he committed suicide by drinking cholera-laced water. People passing me or being passed by me must have wondered as I was "singing" along with the ending of the Overture. "Ba ba ba ba ba ba ba bup ba bah...boom." This is the very familiar overture which, in some settings, can end with cannon fire. A Tympany plays that roll in normal settings. From there, it was back to jazz and Lionel Hampton with Flying Home (1942-1945). If you have any knowledge of jazz, "Flying Home" is one of the most recognized tunes. This CD has several variations on that theme including the original. For those who don't know, Lionel Hampton was a vibraphonist. He played what you might call a xylophone only it was a lot more than just that. The CD has a queer little number, "Blow Top Blues" sung by Dinah Washington. It's just, well, weird. Next was Preservation Hall Jazz Band Volume 2. Why only have one collection of hits when you can have two? I recommend the first one and get this one to supplement. After that, I listened to one of a series, Benny Goodman, Best of the Yale Archives, 1936-1986. When he died in 1986, Benny Goodman left his music notes and tapes to the Yale University Archives. They compiled a series of CD's documenting Goodman's rise from a small trio to a band leader and then back to small group before concentrating on classical music in his later years. This particular CD contains quite a number of his more popular recordings. It does not have his signature song, "Sing, Sing, Sing". I honestly don't remember where I got this and I wouldn't recommend this if you want a collection of Benny Goodman. There are other greatest hits CD's out there or get your hands on the Carnegie Hall concert CD set. I ended with Nina Simone and Little Girl Blue. Nina Simone had a husky, gravelly voice that may not appeal to some people. She could wrap that voice around a song and change how you perceived it. "I Put a Spell on You" is one of my favorites and I love what she did to "I Loves You Porgy". Now to put these back in their jewel cases and select some different music for my travels about town.